The Sparklike Laser is based on laser technology (TDLAS) to measure the Oxygen content inside an IGU, results are then converted to display an Argon, Krypton or mixed inert gas reading. Available in two distinct versions; the Sparklike Laser Standard™ is an offline solution for test labs and desktop use or the Sparklike Laser Portable™ is a whole system integrated into a heavy duty case with wheels and a battery for mobility in factories and building sites. “Already well known in the UK market, Sparklike Handheld's technology is based on plasma emission spectroscopy. A high voltage spark is launched in the IGUs cavity causing a light emission which is observed and analysed further. The user can simply place the device against the unit, press the button and receive an instant result with high accuracy. 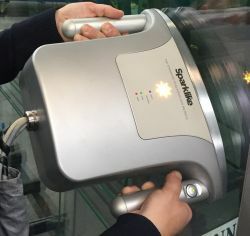 Sparklike Handheld™ is a perfect solution for glass industry's tightening production standards delivering quick and accurate quality sampling.